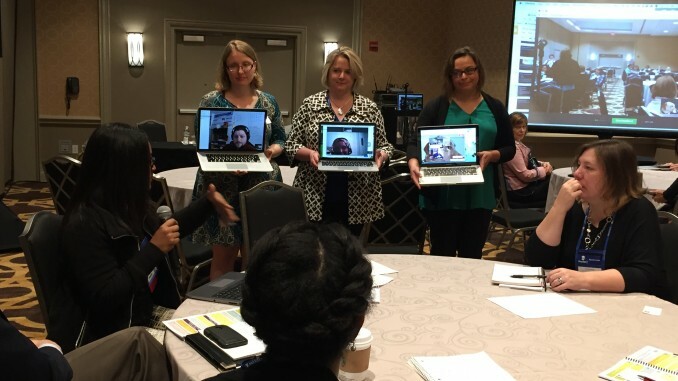 On Wednesday morning, at the OLC Innovate conference, we (me, Autumm Caines, Maha Bali, Whitney Kilgore, Apostolos Koutropolous, Andrea Rehn, and Alan Levine) presented a 90-minute workshop on Meeting the Potential of Hybridity: Equity, Access, and Inclusion. Our presentation itself was both innovative and technically risky. We had some previous experience running a hybrid workshop at the dLRN conference, however, that session did not go as well as we would have liked. We learned some lessons from that session, which informed this session. Our biggest lesson was to ensure that we had solid buddy pairs – and that the onsite and virtual buddies were well prepared to connect during the session. This was emphasized a lot in our planning meetings. Leading up to the conference I was swamped dealing with unexpected renovations and a home move. Fortunately, Autumm stepped in and got us on track. She setup a planning Google Doc and setup a couple of conference calls. One suggestion that she made I loved, that was to use the workshop activity time to do an empathy experiment. More specifically, to get the folks in the room talking to the virtual folks to help them better understand what it meant to attend a conference virtually. Coordinating a large group of co-presenters is a challenge. Our conference calls cycled through many great ideas for implementation, but they kept getting complicated. If we were going to pull this session off, we needed to simplify things. So, I took in all the great ideas, and consulted directly with Autumm and Maha to put together a simpler and cohesive workshop plan. We got buy-in from all the co-presenters. Each buddy pair (Autumm/AK, Andrea/Alan, Whitney/Maha) setup a separate virtual connection on their laptops. Each used a different technology for this video session (demonstrating that we are technology agnostic). Most of the virtual presenters chose to use different devices for the mainstage connection and the one-to-one connection, to make it easier, but also it gave them two views of the room. At all times, the onsite presenters made a special effort to ensure that the virtual presenters could hear! Each presenter introduced themselves. We intentionally setup the introduction order to alternate between virtual and onsite, trying not to privilege either in the introductions. Autumm introduced the empathy experiment. She had setup a Google Doc for each table to take notes in. One person at each table was asked to take notes in the Google Doc, so that the virtual person could see the notes. The room was split into three groups. We had about 8 people per table, which was the perfect number of attendees. One of the buddy pairs sat at each table, and the virtual buddy talked about their experience as a virtual attendee. They talked about their environment and why they were attending virtually. The workshop participants had a chance to ask questions and interact directly with the virtual person. The onsite buddies did a great job of keeping the participant who was speaking in view. Many people commented that it felt like the virtual person was actually there. The virtual presenters also commented that they felt like they were in the room. Whitney ran a quick debrief of the empathy experiment allowing each of the tables to share ah-ha moments. Andrea introduced the action plan activity. Now that the workshop participants had a better understanding of the virtual experience, they were asked to come up with an action plan on what they would do to help support virtual attendees. Again, each buddy pair went to the same table, and the conversations at the tables continued. Notes were taken in the Google Docs (Andrea/Alan, Autumm/AK, Whitney/Maha). Rather than having someone in the room present the results, we turned things around again and had the Virtual presenters (on the main stage) present the learnings from their tables. We had a little time at the end to talk about Virtually Connecting. 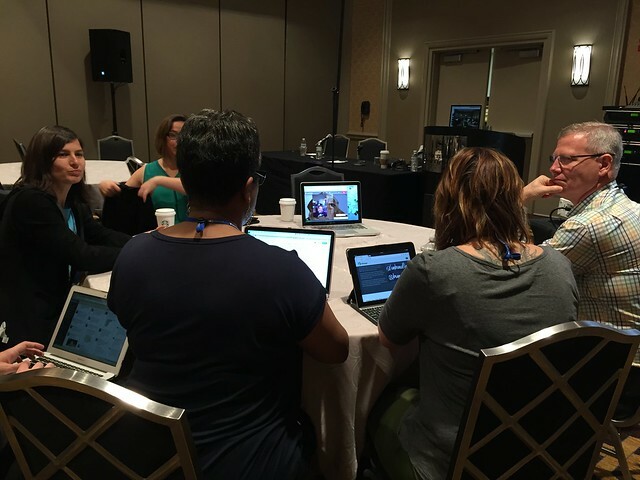 Since we had another session planned that demonstrated Virtually Connecting – the Virtually Connecting Fishbowl led by Autumm – we advertised that session as the follow up to the workshop. The design of the workshop itself involved a lot of technology. We relied heavily on the conference internet connection. I am still rather amazed that we managed to get four video conference sessions (mainstage and each buddy pair) running at the same time without any glitches. We also managed to get audio to work well enough for the virtual presenters to hear everything! The magic in this workshop came right after the empathy experiment, when the tables were reporting on their ah-ha moments. At that time, the onsite buddies brought each of the virtual buddies to the table. At one point, two of them bumped into each other and the virtual presenters saw each other on the laptops. It was a funny, sort of surreal experience generating a lot of laughter. It was something that we never thought of. As the lead facilitator for this session, my job was to watch the time and keep the workshop flowing. It also allowed me time to walk around the room and take pictures. I am so very proud that we were able to pull this off. All the co-presenters did an amazing job. Autumm orchestrated all the logistics (like having bit.ly links to all the Google Docs, and paper printouts for each table to make it easier), without which things may have been chaotic instead of running smoothly. I’m a little jealous that I wasn’t one of the buddies, so I didn’t get to experience the amazing connections that happened at each table. I watched as connections began to form between all the participants at the various tables. It was pretty awesome to see. Were you there? What did you think of the workshop?